I have a new 13 x 19 print engine. Now how do I cut that wider stock? For the past couple of years an 18-1/2″ paper cutter has been the standard for copy centers that work with 12″ x 18″ paper stocks coming out of their digital copiers. But more and more manufacturers are offering print engines that have a 13″ x 19″ paper stock capability that has created new cutting challenges that these 18-1/2″ cutters can’t handle. Paper cutter manufacturers have recognized this issue and have developed new models to meet these needs. Challenge was the first to recognize this issue and developed the Titan series of 20″ cutters. These hydraulic cutters are available in both manual and programmable models. One model offers a light curtain safety system to speed production while still maintaining a safe work environment. Designed and built in the US, they use the same rugged engineering that Challenge has become known for over their 100 plus years in business. Last year Duplo entered the paper cutter market with a line of hydraulic cutters that includes their 490P cutter that offers a 19-1/4″ cut width. Available in manual or programmable models, the programmable model offers an easy-to-read digital display which guides you through all programming operations and cutting positions, allowing for job memory storage of up to 72 cut locations and 9 job selections. Although they have just introduced their newTruimph 5222 hydraulic 20″ Digicut cutter, MBM has a reputation for manufacturing high quality paper cutters with a competitive price point. Available as a programmable model, this unit offers all the bells and whistles like: Safety light beams protect the operator and allow back gauge to automatically advance to the next cut. High storage capacity, programmable “EP” back gauge control module with 10 button keypad and LED display stores 99 programs of up to 99 steps. 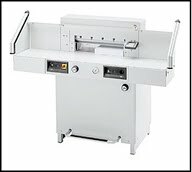 For more details on any of these paper cutters speak to your Spiral Account Executive.